Our custom steel frames are designed specifically for each rider and the type of riding and bike that that customer is ultimately looking for. We do offer a LIMITED warranty to the original owner only. This warranty covers any defects in the brazed joints for the life of the frame, and 5 year warranty on the materials, it does not cover damage due to rust or misuse. 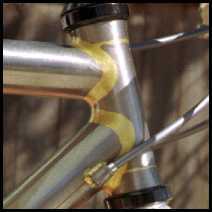 Steel bicycle frames are subject to rust and care must be taken to prevent damage to the base material. It is recommended that you, or your mechanic, care for your steel frame by greasing any of the contact points including the seat tube binder, seat tube opening, head tube headset faces & bores, bottom bracket threads and faces, all threaded braze-ons or bosses, derailleur hanger threads, and cable guides. In addition it is recommended to use a rust-inhibitor product on the inside of the tubes at least annually. At Worthington Cycles we use Boeshield T9 spray in all of the tubes. The paint should be protected, regularly cleaned, and any chips or scratches repaired to prevent rust. Removal of the seat post and/or bottom bracket after riding in the rain can also prevent water from building up inside the frame. Additional steps like adding a chainstay protector and cable protector pads at rub points will further extend the life of the paint.